Today I am grateful for being able to grow beautiful flowers I can cut from the garden and bring into my home. I’ve always loved having fresh flowers in a vase in my home … maybe more than one vase full at a time. Now that I am growing beautiful flowers in my own garden, cutting flowers to bring inside is something I do all the time and it gives me great pleasure. For that I am grateful. 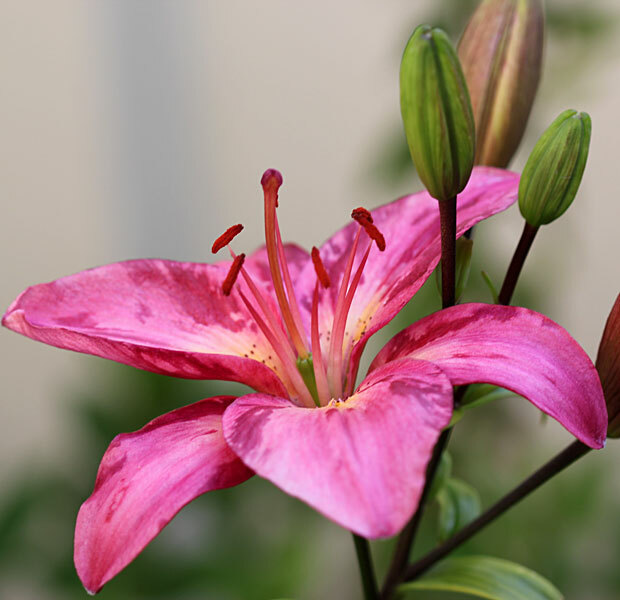 Photo: Asiatic Lily. The Asiatic Lilies I planted this year as bulbs have given us immense pleasure. From pure white to pale and this bright pink (and a few stray yellows) they have been my most successful bulb planting, giving us pleasure and gorgeous colour in the garden for weeks on end. 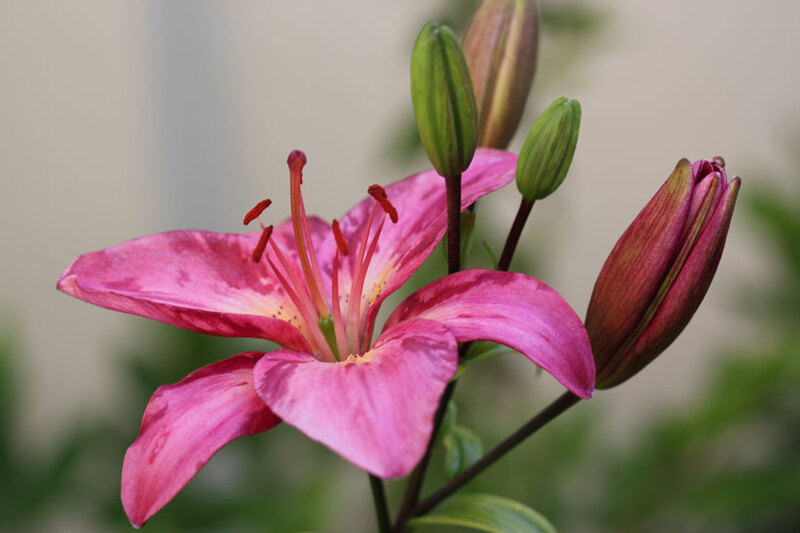 The soft pinks and some whites started to flower end August and now in mid November the Lilium Longifolium are still flowering beautifully. The best part is they will come back next year! Lilium longiflorum, often called the Easter lily or November lily, is a plant native to the Ryukyu Islands (Japan) and Taiwan. It is a stem rooting lily, growing up to 1 m high. It bears a number of trumpet shaped, white, fragrant, and outward facing flowers. I love the fact of bringing the garden inside! Enjoy! Our flowers here are usually so small that I’ve ended up with a collection of small vases so as not to overwhelm the little blooms! I like bringing them in too. I like bringing all kinds of natural treasures inside…I have bird nests, acorns, leaves, flowers, feathers. It seems to have been passed to the next generation too; my daughter brings in small bones she finds ;/ along with all the other treasures mentioned above! I always admire folks who bring flowers in…for some reason I cannot bring myself to cut them unless it is for a special occasion and then usually it is something like daffodils that I have hundreds of…maybe I need to grow more plants so I won’t feel so bad about cutting them. I always have a hard time cutting flowers, so do it rarely. It seems they should stay in the garden, so that’s where I leave them. Of course, I probably don’t have as many vase-worthy blooms as you do, so maybe quantity is key.